As a teenager, my cousins and I would escape to my grandparents’ basement during holiday feasts for a few games of darts. 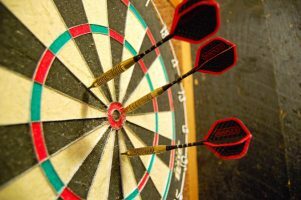 Everyone who has casually played at least once in their life knows the objective is to throw darts at the board, and the closer to the target, the better the score. One simple rule of darts is in the name of the game: You’ll only succeed if you use darts. If you try to throw a plunger at a dart board, you aren’t going to get very far. The same rule applies to developing a game plan to meeting targets and achieving outcomes within an organization. The dartboard represents the outcome an organization is striving to achieve, and the darts represent the specific activities an organization will do in an attempt to achieve its outcome. Just like with darts, you don’t know if an activity is going to result in the outcome. Like aiming before a dart is thrown, organizations select activities they believe, based on past experiences and understanding of the outcome, will work to achieve the outcome. And, also like wind and other factors, unexpected variables that cannot be controlled by the organization will also impact the ability to achieve an outcome. Initially, the “Outcomes” column should be thematic, such as “Remove barriers to participating in recreation programs,” “Develop a sense of community” or “Ensure all children are on track for kindergarten.” Eventually, though, organizations will set outcome metrics with specific targets. These metrics should only be developed after significant baselining, and a stronger understanding of the correlation between input and output metrics tied to specific activities and the achievement of the outcome. The metrics, as listed below, are inputs or outputs tied to specific activities. These are measures an organization can directly control, such as the number of trainings offered or percentage of potholes filled in a 24-hour period. The key of any performance management program is to understand the nexus between a metric of filling potholes in 24-hours and an outcome of effective and efficient government. To do this well takes time, and quite a bit of trial and error. But just as you wouldn’t use a plunger to win at a game of darts, selecting activities that match with your desired outcome are critically important to the success of any performance management program.